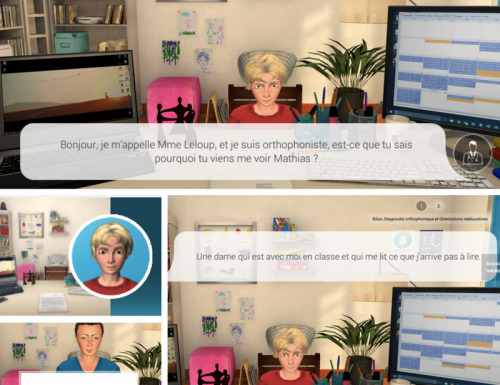 Discover 3 clinical cases developed with Professor Peggy Gatignol, director of teaching in the Department of Speech Therapy of the Université Pierre et Marie Curie (UPMC) in Paris. With the project of supporting the training of UPMC speech therapy students, the SimforHealth team and Professor Peggy Gatignol have created 3 virtual clinical cases which their students can access via the MedicActiV platform. These cases, consisting of 2 to 4 consultations, are specific to 3 teaching units in the UPMC speech therapy training program. The case of Mathias, aged 10 years, who suffers from dyslexia. The case of Claire, aged 34, who was a victim of serious head injury sustained in a road accident and now suffers from aphasia. The case of Mathilde, aged 44, who suffers from deafness and is consulting her speech therapist to have a cochlear implant fitted. 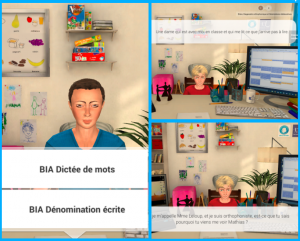 During the virtual consultations, the students can converse with their patients, establish their profile, carry out examinations such as reading tests, spoken language assessment, a “BREV” (cognitive function) test and many other investigations which the students can access as often as they wish. These virtual clinical cases therefore allow the students to immerse themselves in a genuine learning environment. Professor Gatignol wanted to make these 3 cases available, not only to supplement the training of the 600 speech therapy students at UPMC, but also to be able to follow up their progress and achievements. Indeed, throughout the clinical cases, the students are offered quizzes. As the supervisor of these students, Professor Gatignol can access all the results of these, via the MedicActiV platform. That enables her to follow their progress but also to see which questions often cause problems so that he can go back over them in class. This also facilitates the broader educational aim of correcting and improving the training program in place. Feedback from students who have tried out these virtual clinical cases is very positive and we are very proud to be supporting health professionals at the heart of their training.